Hurricane Michael slammed into the coast of Florida on Wednesday. With maximum wind speeds of 155 mph, the storm ripped roofs off of homes, snapped trees, and flooded streets. The storm’s low central pressure makes it the strongest that region has ever seen, and the most powerful in the US in nearly 50 years. A large part of the reason Michael is so bad is because the water in the Gulf of Mexico is around 5 degrees Fahrenheit warmer than it should be at this time of year. Hurricane Michael came roaring ashore in the Florida Panhandle on Wednesday. The Category 4 storm had maximum wind speeds of 155 mph as its eye touched down northwest of Mexico Beach. Based on its low central pressure, Michael is the strongest storm that region has ever seen, and the most powerful hurricane the US has weathered in nearly 50 years. The storm has already ripped roofs off of homes, sent a porta potty flying through the air, and inundated areas along the coast with more than 7 feet of water. Michael developed and organised quickly in the Gulf of Mexico, strengthening from a messy tropical depression into a swirling funnel in just 72 hours. Hurricane hunters still don’t understand perfectly why storms go through such impressive periods of rapid intensification, but they do know that warm water provides the essential fuel for hurricanes to form. Right now, the waters along the Gulf Coast of Florida are anywhere from 4 to 7 degrees above what’s normal for this time of year, according to federal temperature sensors. In Pensacola, the water temperature on Wednesday was recorded at 81.9 degrees Fahrenheit, nearly 8 degrees warmer than average. 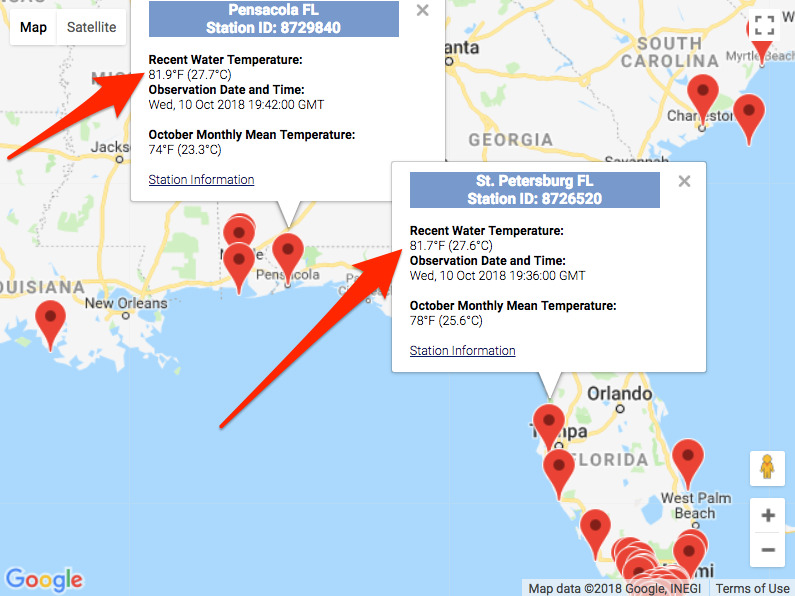 In St. Petersburg, the water was a balmy 81.7 degrees – almost 4 degrees above the norm. That warm ocean water pumps more heat and evaporating seawater up into a hurricane, giving the storm extra juice. Much of the reason why the gulf is so warm these days is that as humans burn fossil fuels to power our buildings, transportation, and manufacturing, the gases that emits enter the atmosphere and cause it to trap more of the sun’s heat. Earth’s oceans have soaked up 90% of that extra heat, making them a breeding ground for fiercer storms. In a paper published in Geophysical Research Letters in May, scientists tracked 30 years of tropical storms (from 1986-2015) and found that the central and eastern tropical Atlantic, from the eastern Caribbean islands to Florida, has indeed seen more rapidly intensifying storms in recent years. Another study published in 2012 showed similar results, finding that storms can intensify 20 hours faster than they used to, in some cases. “Every hurricane will be more likely to be an intense hurricane,” James Done, an atmospheric scientist at the National Center for Atmospheric Research recently told Business Insider. Unless major steps are taken to cut emissions and curb climate change, Hurricane Michael is likely only a preview of the kind of catastrophic, devastating storms that are yet to come.